Laburnum (Laburnum spp. ): growing, planting, caring. Yellow flowers - like a golden rain ! Scientific name : Laburnum spp. 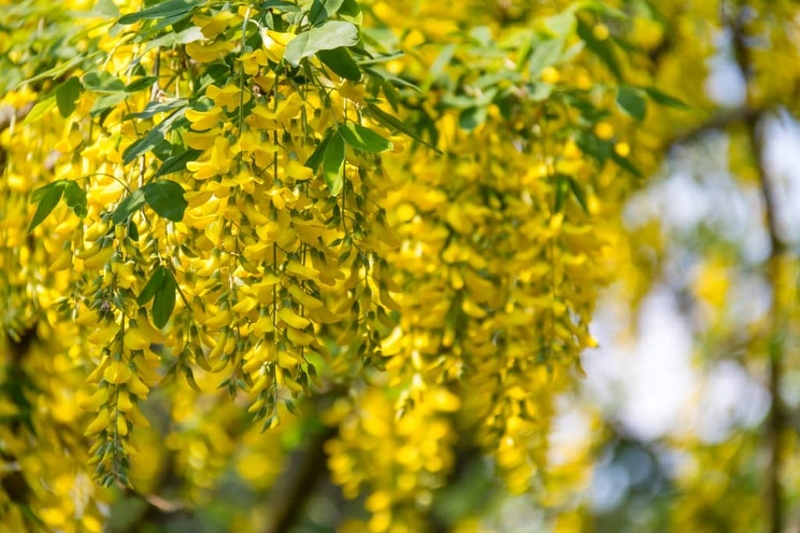 Laburnum - golden chain or golden rain - is a genus of two species of small trees in the pea family Fabaceae, Laburnum anagyroides - common laburnum - and Laburnum alpinum - alpine laburnum. They are native to the mountains of southern Europe from France to the Balkans. They are deciduous trees with trifoliate leaves, somewhat like a clover - the leaflets are typically 2–3 cm (1–1 in) long in L. anagyroides and 4–5 cm (1.5–2 in) long in L. alpinum, and yellow pea-flowers in pendulous leafless racemes in spring, which makes them very popular garden trees. The laburnums are shrubs with alternating deciduous foliage. The laburnum has alternate leaves with three palms at the end of very long petioles. The leaves are green at first, then yellow before falling, and measure less than 10 cm. The flowers are borne in hanging clusters that look like Wisteria flowers, but yellow in color. They are with 5 petals that form a kind of "beak". They appear in May-June. Then brown pendulous and flat pods form. The common spleen, which is the type species, reaches 8 meters in all directions, while the cytise of the Alps is confined to 2 meters. In the open-soil, plant preferably in autumn, possibly in early spring, outside periods of frost. Find a sunny spot in humus soil, cool and drained, rather neutral. Plan to leave one and a half meters between each plant. Make a hole 1/3 wider than the root ball, possibly baste it. Plant without burying the collar of the root - which is the line that marks the boundary between roots and branches - and water copiously. Water regularly and generously for several weeks after planting or sowing, especially if you did it late in the season. Water in case of drought. For a harmonious habit, cut in March the dead branches, those that entangle or return inward.